Rectangular plastic dash plaque with metallic foil framed edge. Artwork area consists of a laminated full color printed digital label. Double side tape comes on the back. 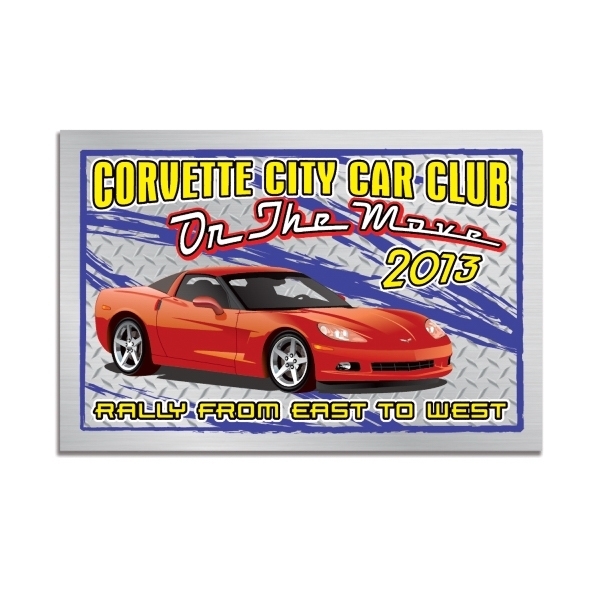 Great for car shows, cruise ins, show and shines, favors, souvenirs, dash plaques and much more. Magnet back is available: call for pricing. 100% Made in the USA. 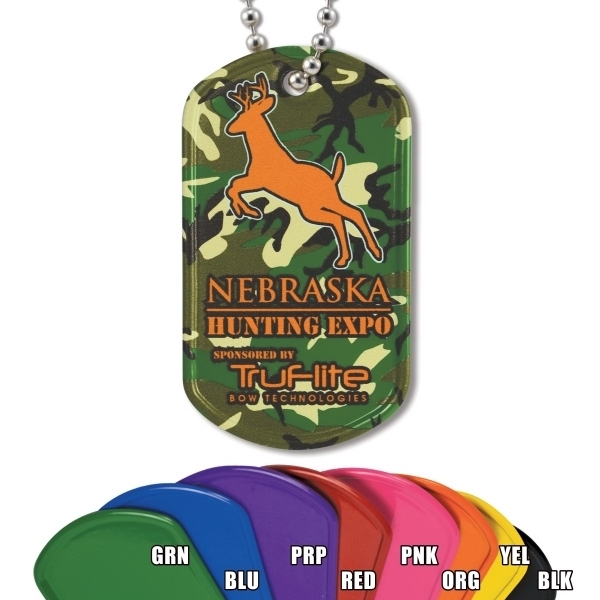 Available in your choice of 7 foil edge colors. This rectangular aluminum dash plaque has artwork printed directly on the part and then laminated. Available in brushed gold or brushed silver. Double side tape comes on the back. 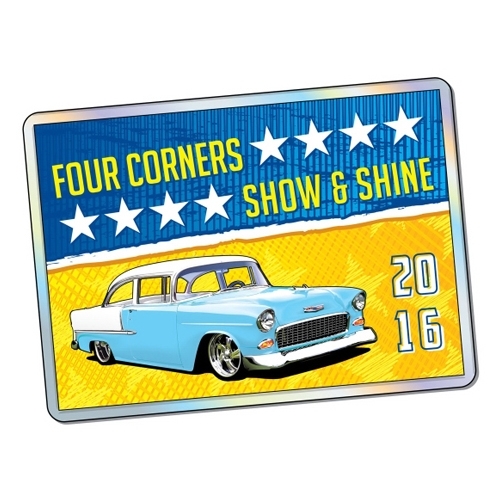 Great for car shows, cruise ins, show and shines favors, souvenirs, dash plaques and much more. Magnet back is available: call for pricing. 100% Made in the USA. Please specify gold or silver when ordering. 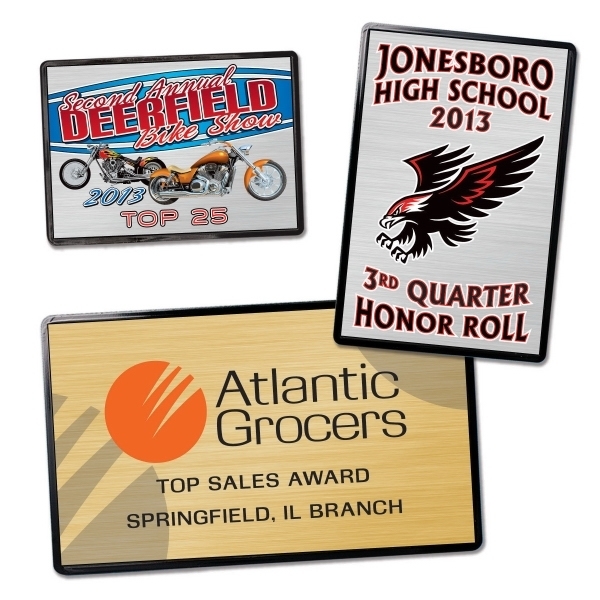 This square aluminum dash plaque with white coating has artwork printed directly on the part and then laminated. Double side tape comes on the back. 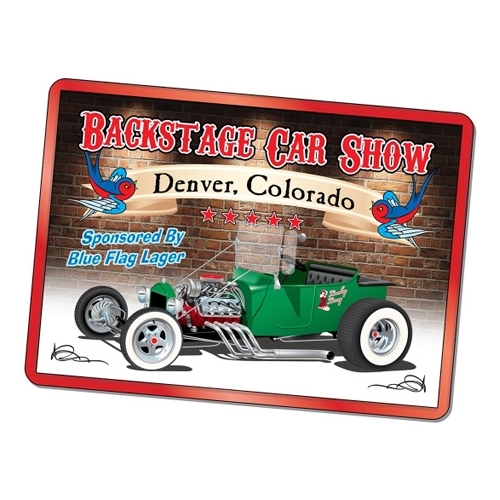 Great for car shows, cruise ins, show and shines favors, souvenirs, dash plaques and much more. Magnet back is available: call for pricing. 100% Made in the USA. Rectangular plastic dash plaque with metallic foil framed edge. Artwork area consists of a laminated full color printed digital label. Double side tape comes on the back. 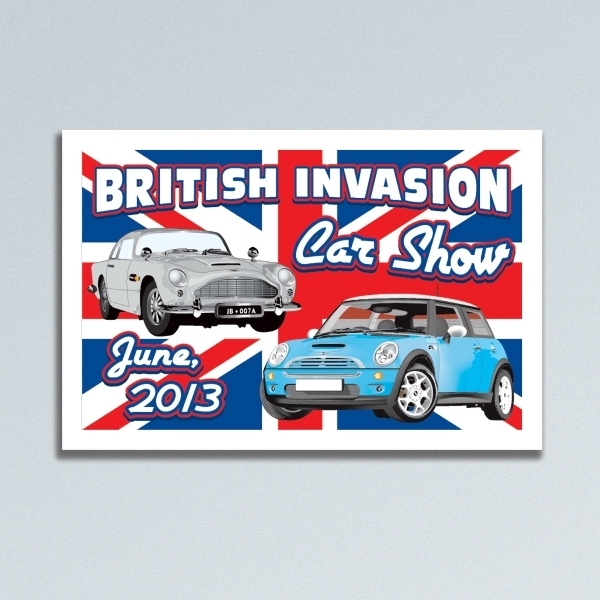 Great for car shows, cruise ins, show and shines favors, souvenirs, dash plaques and much more. 100% Made in the USA. Available in your choice of 7 foil edge colors. Please specify color code when ordering. Magnet back is available: call for pricing. Stock car show art available for use. Call for more info. 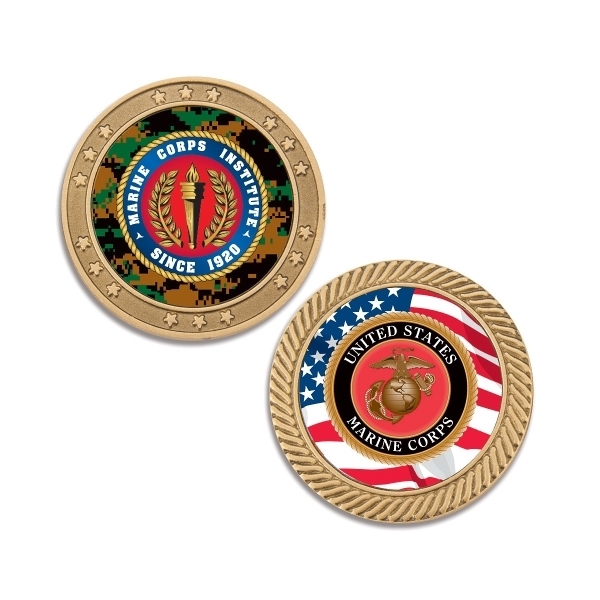 This metal coin is gold plated and 1.75" round with a plain edge. The artwork area consists of a laminated full color printed digital label on 2 sides. 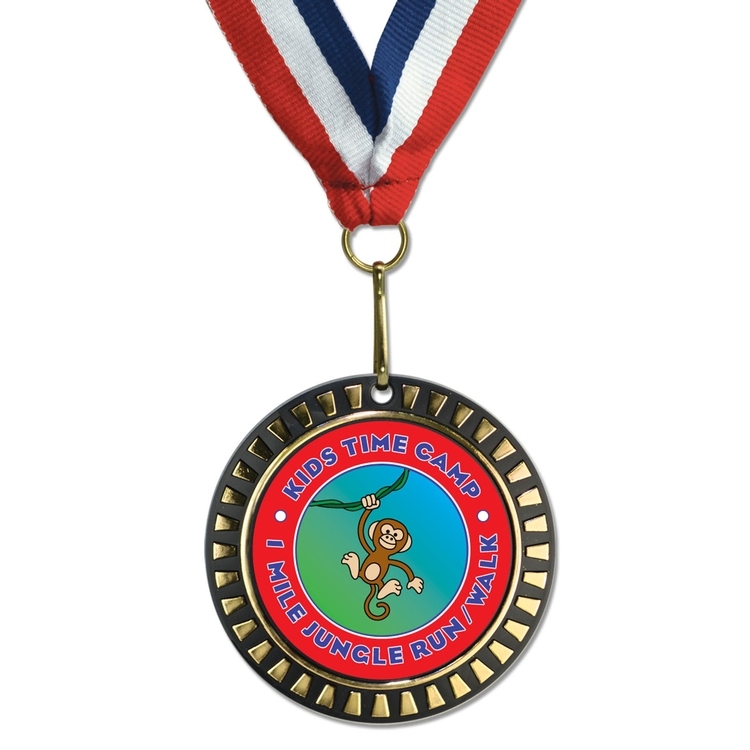 This is great for awards, sports teams, trading, flipping, keepsakes, fundraisers, party favors, souvenirs and much more. Printed and assembled in the USA. 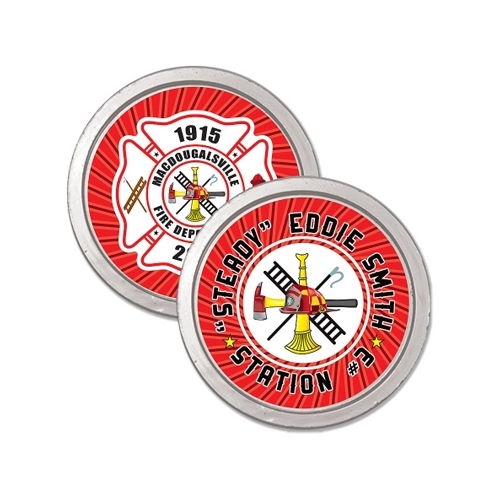 This metal coin is silver plated and 1.75" round with a plain edge. The artwork area consists of a laminated full color printed digital label on 2 sides. 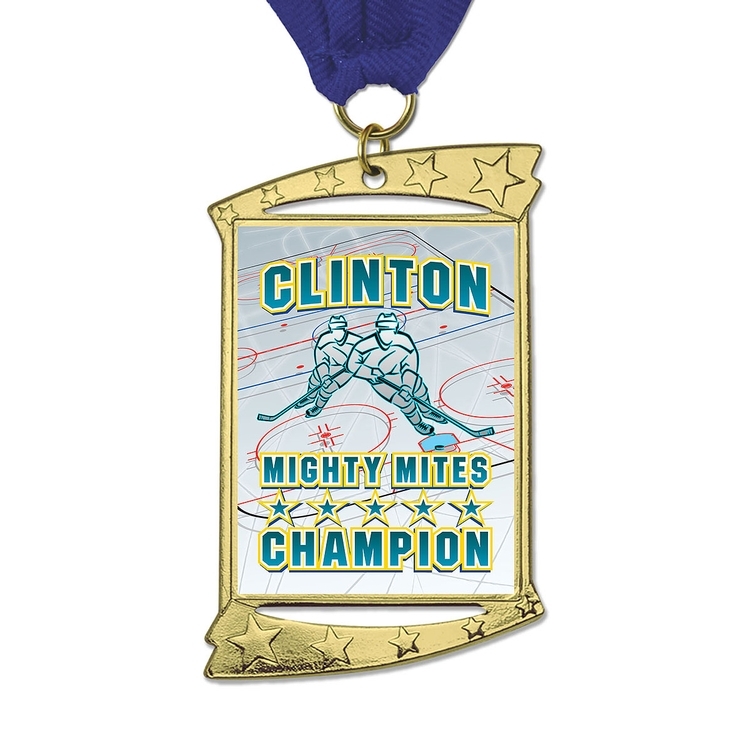 This is great for awards, sports teams, trading, flipping, keepsakes, fundraisers, party favors, souvenirs and much more. Printed and assembled in the USA. 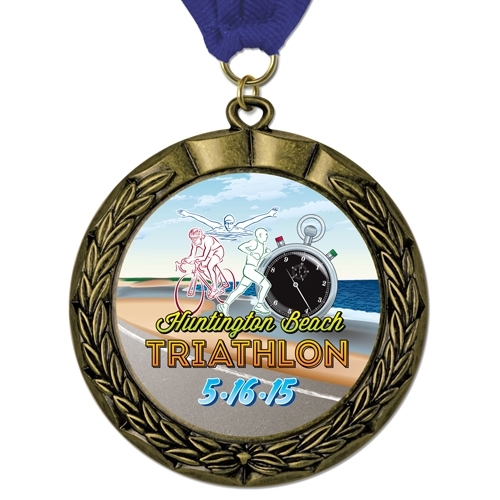 This medal comes with a full color printed laminated insert. 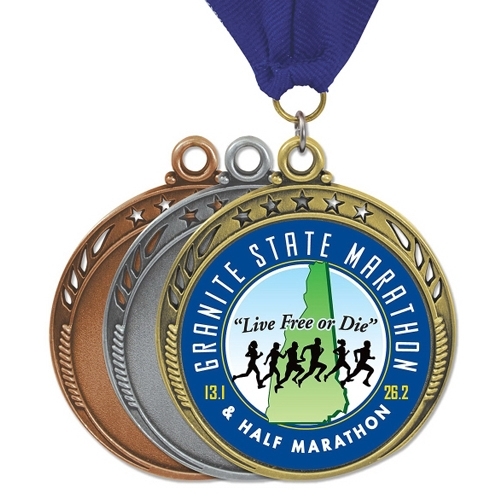 Choose from gold, silver or bronze metal. Add a 1.5" Neck ribbon with jump ring (shown) or .875" youth ribbon with snap-clip for additional cost. Please specify colors when ordering. 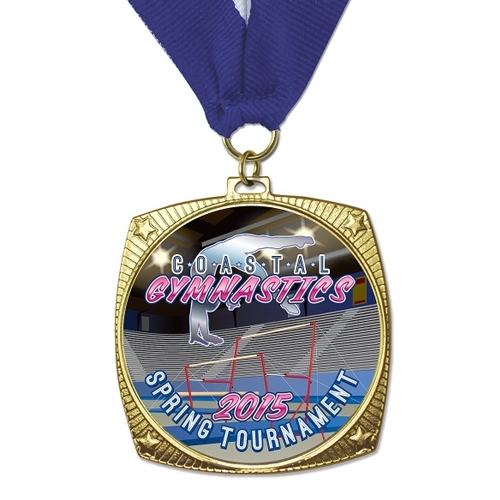 Also available with domed or metallic insert for additional cost. Printed and assembled in USA. 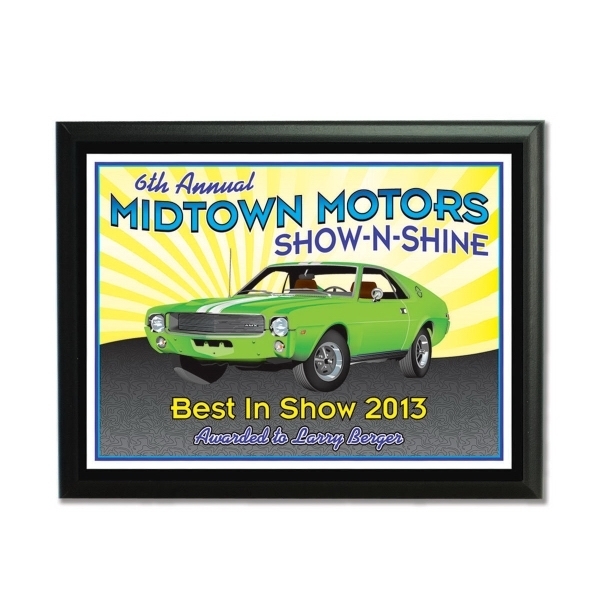 Rectangular plastic dash plaque with metallic foil framed edge. Artwork area consists of a laminated full color printed digital label. Double side tape comes on the back. 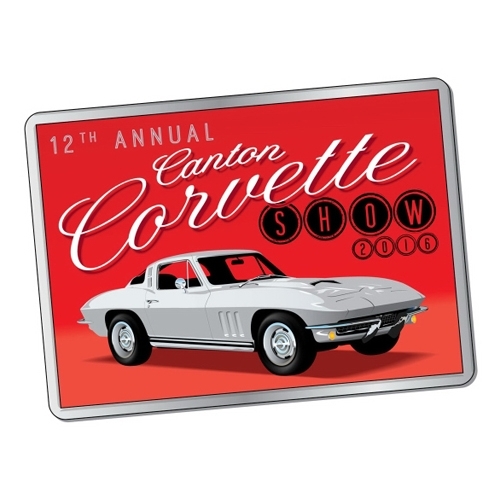 Great for car shows, cruise ins, show and shines favors, souvenirs, dash plaques and much more. 100% Made in the USA. Available in your choice of 7 foil edge colors. Magnet back is available: call for pricing. Please specify color code when ordering. 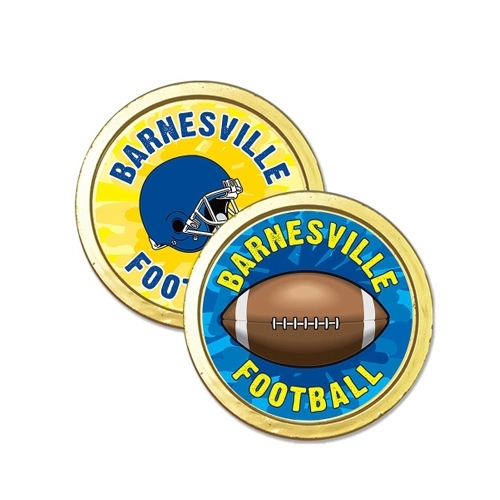 This metal coin has an antique silver finish and is 1.75" round. It has a star pattern on one side and a swirl pattern on the other. The artwork area consists of a laminated full color printed digital label on 2 sides. 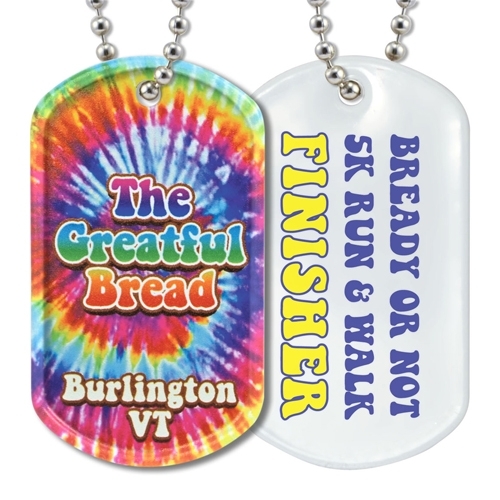 These are great for awards, sports teams, trading, flipping, keepsakes, fundraisers, party favors, souvenirs and much more. Printed and assembled in the USA. 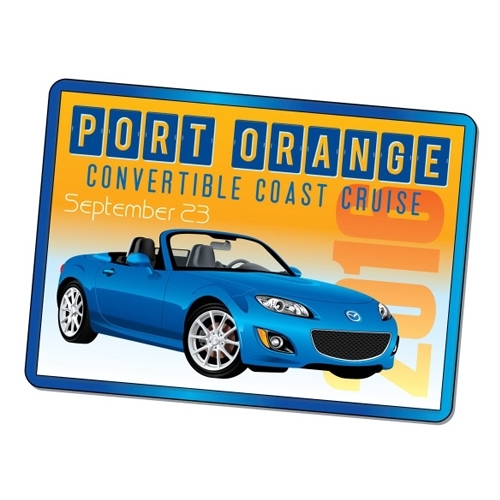 Rectangular plaque with standard full color plaque mount. 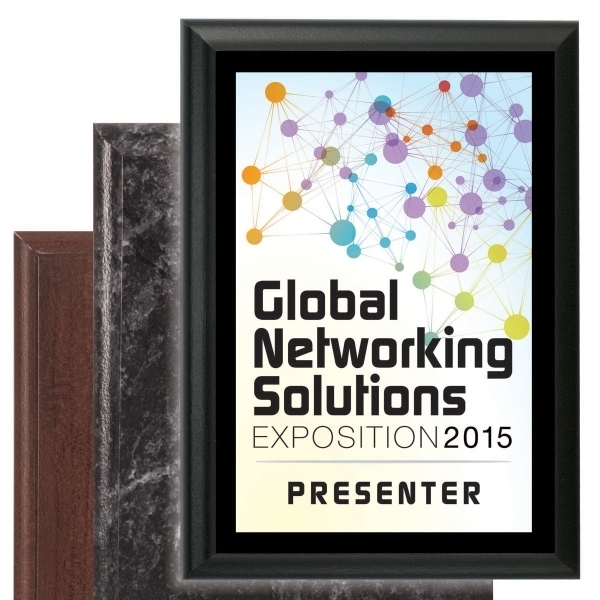 Artwork area consists of a laminated full color printed plaque mount. Provided complete on on matte black wooden plaque. Other plaque materials and colors available by special order. 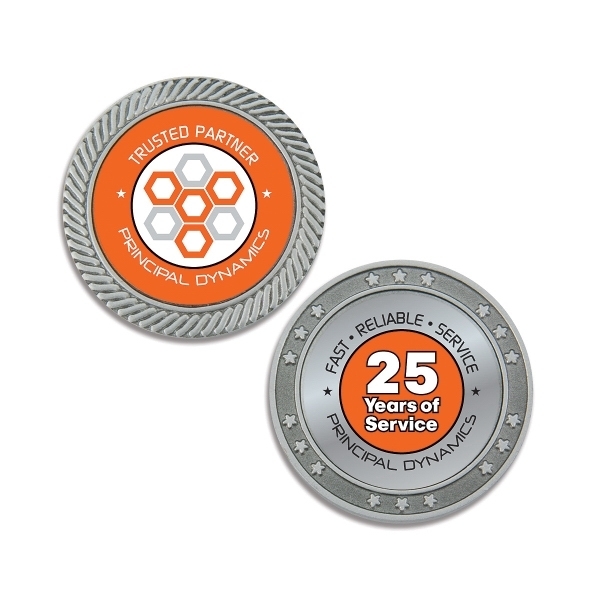 Great for awards, recognition and much more. 100% Made in the USA. Rectangular plaque with full color plate. Artwork area consists of a laminated full color printed plaque mount on a white coated aluminum plate. Provided complete on on matte black wooden plaque. Other plaque materials and colors available by special order. Great for awards, recognition and much more. 100% Made in the USA. 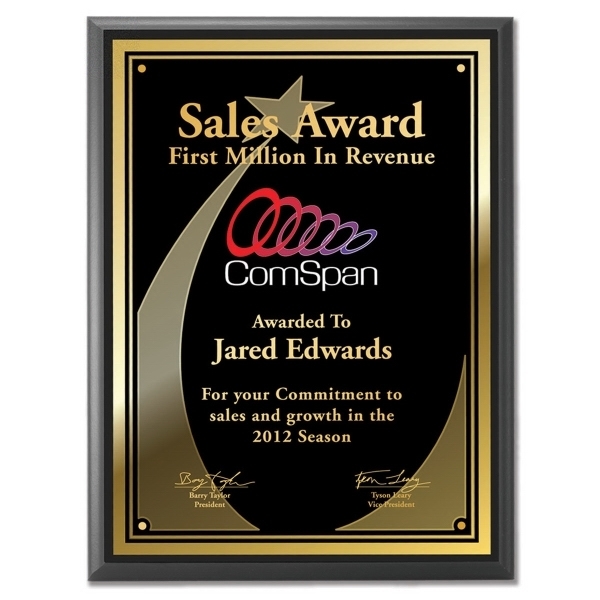 Rectangular plaque with full color brushed gold or brushed silver aluminum plaque mount. 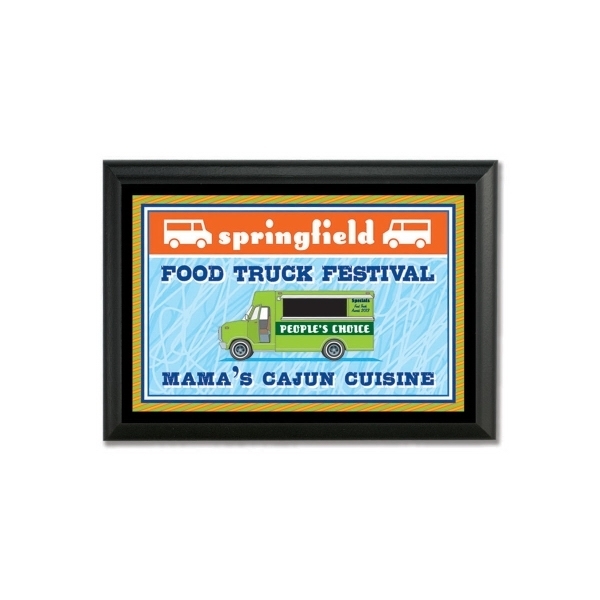 Artwork area consists of a laminated full color printed aluminum plaque mount. Provided complete on on matte black wooden plaque. Other plaque materials and colors available by special order. Great for awards, recognition and much more. 100% Made in the USA. (Please specify gold or silver when ordering).